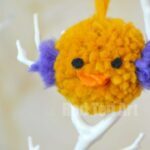 We haven’t made a Pom Pom Craft in a little while.. and with our love for Homemade Ornaments, I thought a Pom Pom Ornament would be in order. 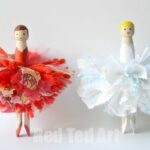 My kids are rather crazy about Penguin Crafts right now (we have an amazing set of DIY Penguin Ornaments for you to check out), so why not bring the two together? 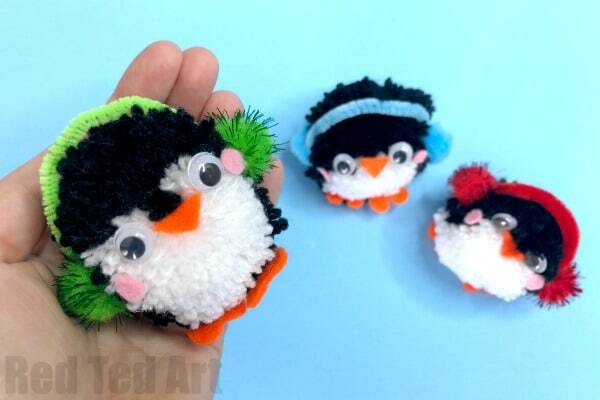 Though officially these are Pom Pom Penguin DIY Ornaments, these cute little Penguins would make great Penguin Key Chains, Penguin Backpack Charms or simply Pom Pom Penguin Toys/ decorations.. ah yes. 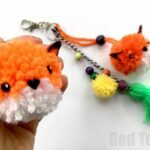 The pom pom possiblities. 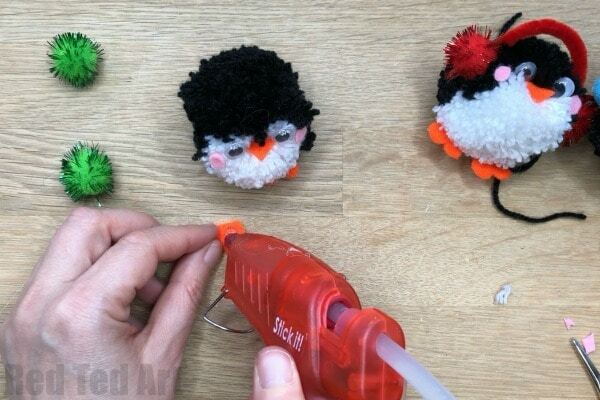 I would love to know what YOU will do with YOUR Pom Pom Penguin. 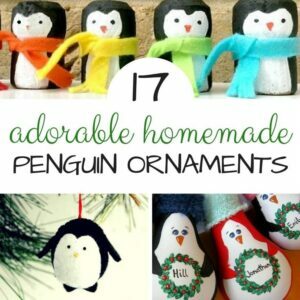 Our penguins join the great CRAFTMAS challenge on Instagram. Do check it out! 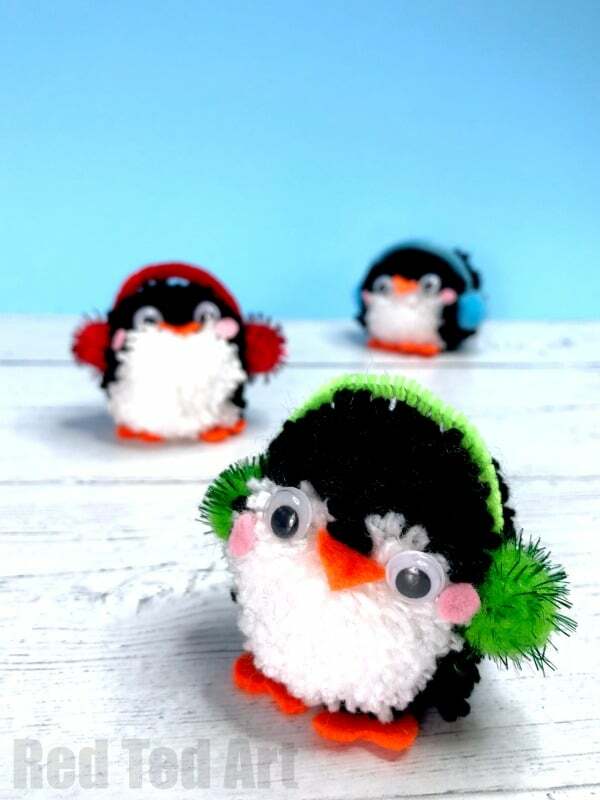 The other thing to note about today’s craft.. though I give you a basic “pom pom pattern”… I find that each penguin comes out with a completely different character. Embrace these differences and be excited about the fact that your creations will be different. Will you have a short chubby one or a long thin one? 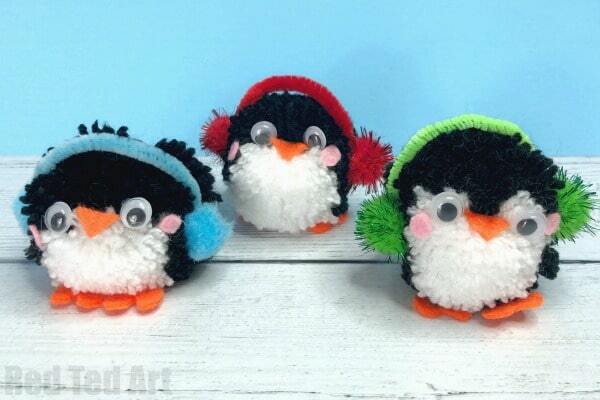 What colour ear muffs will your penguin have? Enjoy! 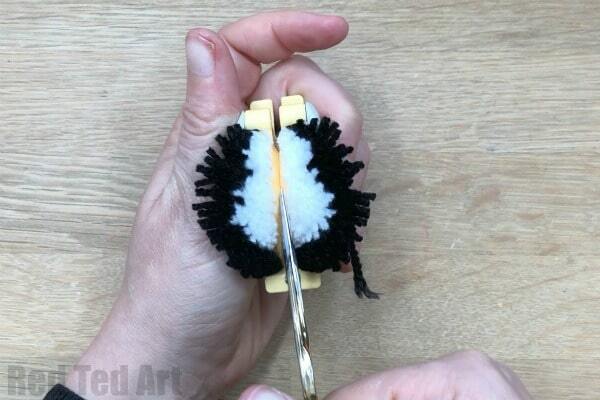 Watch our quick and easy Pom Pom How To video or follow the step by step instructions below! 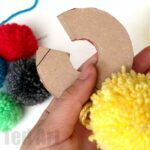 Begin by wrapping 2/3 of the first half of your pom pom maker (whether you are using a pom pom maker OR a cardboard disc) in white wool. 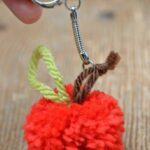 Wrap it quite thickly, but NOT until the pom pom maker is full. Now wrap black wool over the TOP of that 2/3s and fill up the rest of the pom pom maker in black too. 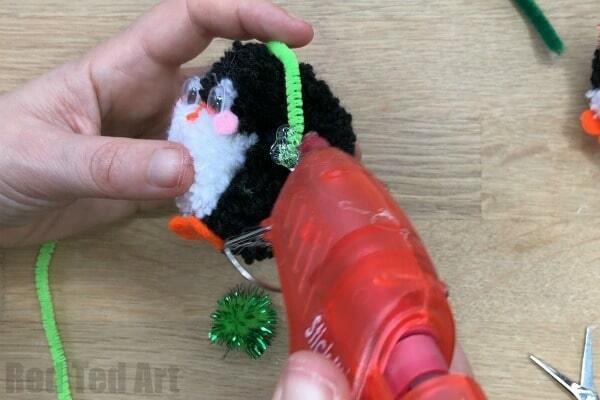 If you are using a pom pom maker, do make sure you get into all the corners too. 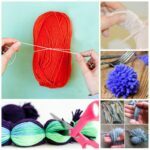 And tie off your pom pom with some wool. 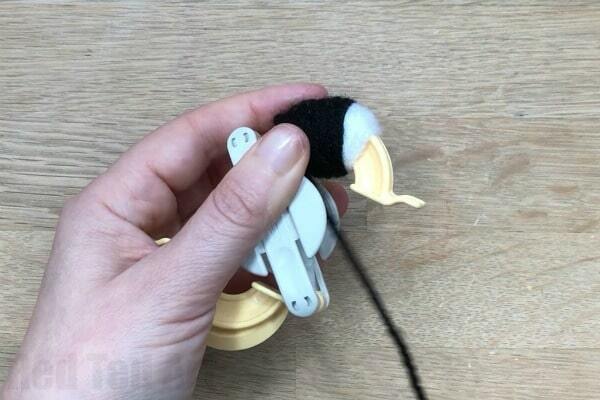 You can leave a longer piece of black wool by the knot for hanging. But this will depend a little on which way up your penguin will go. 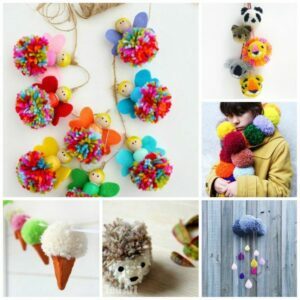 You can always tie some wool to the ear muffs for hanging. This is where the fun begins, and where each penguin will turn out differently. 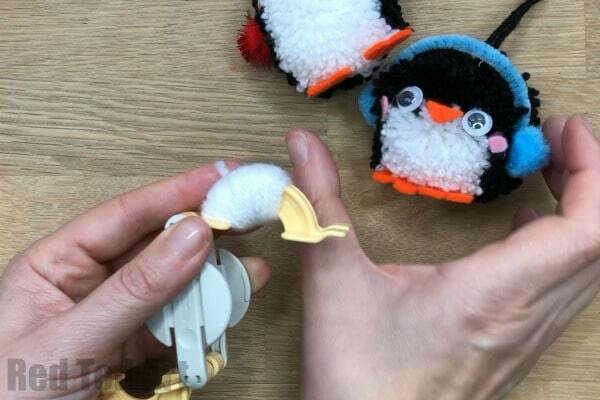 Have a good look at the pom pom – do any features stand out… would the penguin look better one way or the other? You can tidy your white/ blank strands a little by tucking them in. I noticed that m “white bit” had little black centre parting.. and thought that would make the perfect penguin face position. 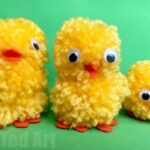 Cut an orange beak, two feet (small hearts), some pink cheeks, get your googly eyes ready and heat up your hot glue gun. Glue all the features in place. 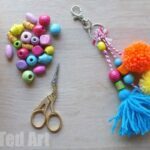 Finally get a piece of pipecleaner and mini pom poms (from the shop). And again glue in place. 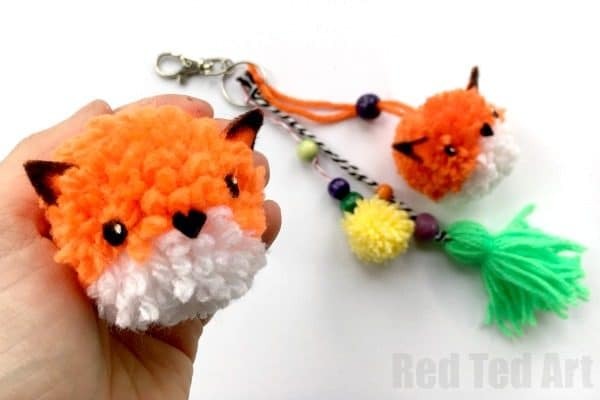 And you can see how the fox pom pom makes a great Backpack Charm – add some white pom poms and blue tassels for that wintery feel to your Pom Pom Penguin DIY Ornament and you have a great Winter Back Pack Charm!